Topics: Resumes, Resume Content, Cover Letter, and Professional Resumes. Age: The domain is 13 years and 8 months old. 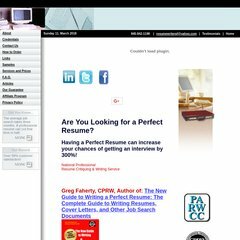 a-perfect-resume.com Resume Critiquing Service | New York City Professional Resume ..
On average 1.60 pages are viewed each, by the estimated 140 daily visitors. Olm Llc (Connecticut, Trumbull) is the location of the Apache server. Its IP Number is 209.204.225.51. Its 2 nameservers are ns2.host4u.net, and ns.host4u.net. A ping to the server is timed at 36.3 ms.